Jeff Nichols’ impressive drama TAKE SHELTER grips you from start to finish. You wake up afraid, not knowing for a moment, if what you’ve dreamt really happened – a disturbing vision of an impending disaster, or your mind playing tricks on you. This is what life becomes like for Curtis, the softly spoken family man at the heart of writer / director Jeff Nichols’ exceptional drama TAKE SHELTER. Curtis lives with his wife and daughter on a small holding in the mid-west and at the start of the film, we find him becoming increasingly disconcerted about the cloud formations in the sky – could there be a really big storm coming? But later, when he begins to dream that there is and it will destroy everything in its path, he begins to quietly panic. He decides to renovate the old storm shelter in his backyard for when the inevitable (as he thinks) happens and in doing this, he puts his marriage, job and sanity on the line. What makes the movie stand out is that it keeps you guessing every step of the way as to whether Curtis is a kind of prophet who’s foretelling the disaster to come and should be listened to, or a man going steadily insane driven by the thoughts that his mother broke his family apart as a child due to her mental instability. 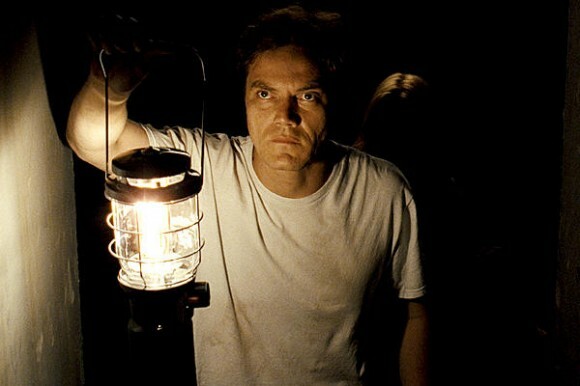 It’s a fascinating journey we go on with Curtis, who’s played to perfection by Michael Shannon. Having been blown away by the first performance of his I’d seen, the Oscar nominated Revolutionary Road and excited about the prospect of him as General Zod in the forthcoming Man of Steel, here you see other sides to Shannon – at times all gruff bullishness to get things done his way but then at others, he’s a kind of gentle giant, displaying a beautiful tenderness with his family. He’s clearly a great actor and he’s matched every step of the way in the movie by Jessica Chastain as his wife Samantha. I would have loved to see her walk off with this year’s ‘Best Actress’ Oscar for her searing portrayal of CIA officer Maya in Zero Dark Thirty but it wasn’t to be. Here though, like Shannon, we get to witness her breakout role and it’s exciting to watch. Her Samantha is a fantastically practical woman with a sometimes steely demeanour, combined with a softer, mother earth-side. When Curtis is quiet and withdrawn, she knows how to handle him and you see this is also the study of a marriage, how successful couple’s personalities fit and how in this instance, Curtis and Samantha work together. Chastain’s role in the movie is another great example of how Nichols juggles our expectations – will Samantha support Curtis when his behaviour becomes increasingly unhinged, or abandon him as so many of these kind of characters do when the going gets a little rough? So with the tension mounting up and the pressure on Curtis reaching breaking point, he visits his mother (played by the wonderful Kathy Baker) and poignantly tries to find out whether he has inherited her madness, the quietness of their reunion contrasting brilliantly with the scene at a community evening when Curtis loses his cool big style and warns his neighbours that life as they know it is ending and they’d better heed his words because he’s right. But is he? As I said, you’re kept on a knife-edge as to whether Curtis is right or wrong and it’s always great to watch a movie made by such a skilled film-maker who can keep you wondering how it will all turn out until the very last scene – Nichols is certainly that film-maker and he does it here with real style. I’d heard such wonderful things about TAKE SHELTER that I feel so stupid for only catching it now and I now want to catch more of Nichols‘ and Shannon’s work – their collaborations are fast becoming the by-word for intelligent, thought-provoking drama. Shotgun Stories, their first picture together in 2007, was made for next to nothing and gained a cult following and their newest Mud, is on release now with superb notices. With word of their next collaboration now in the works, on the strength of this movie, I’m sure it’ll be unmissable.